The Cambridges had a family outing together on Saturday when they attended the wedding of a family friend. The Duchess of Cambridge, who is currently on maternity leave following the birth of her son Prince Louis in April, made a rare appearance for the nuptials of her close friend Sophie Carter to Robert Snuggs at St. Andrew’s Episcopal Church in Norfolk. 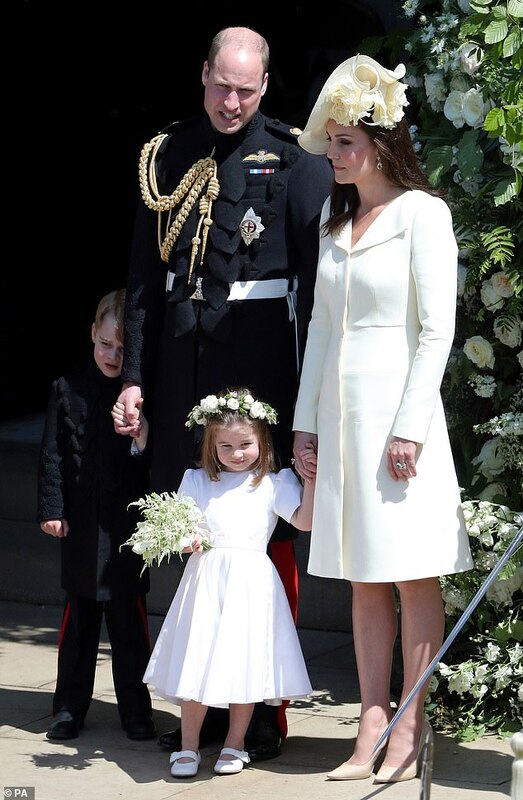 She was joined by the Duke of Cambridge as well as Prince George and Princess Charlotte who were given the role of pageboy and bridesmaid to Sophie who is also Charlotte's godmother. Prince Louis is believed to have remained at home with the family's nanny, Maria Borrallo. According to People the brother and sister, who have played bridesmaid and pageboy twice before at their auntie Pippa's wedding last year and Uncle Harry's in May, were dressed in traditional white and blue ensembles and made up a wedding party of seven. The outfits worn by the two siblings are believed to have come from Amaia Kids as royal watchers have shrewdly observed. While there are no photos available of Charlotte, 3, and George, 5, the Chelsea based clothing brand shared a snap of a series of flowergirl and pageboy outfits fitting that description on its Instagram account.